This DIY Velvet Pants is a special project for me. 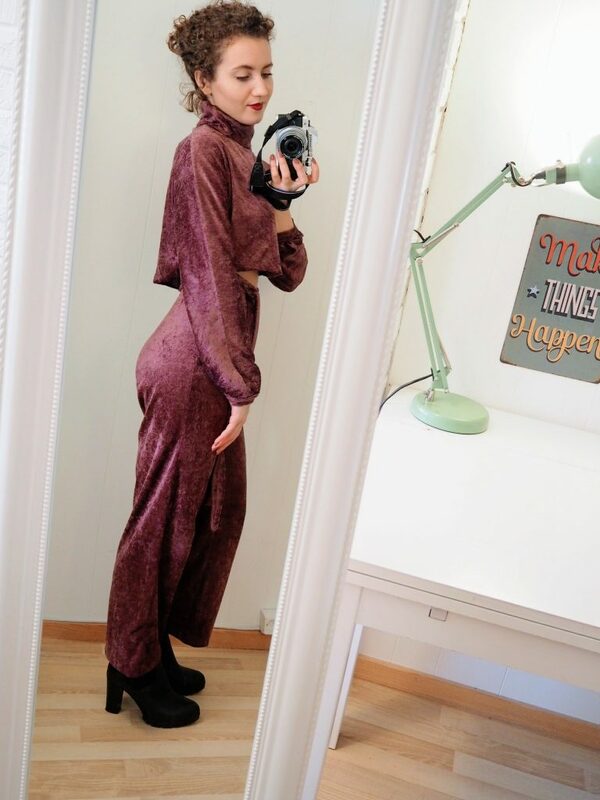 Secondly, it is a part one of the tutorial because I made a set- velvet pants and velvet crop top. It is a killer! I made it to celebrate my birthday. After all, every girl deserves a little sprinkle of special in her life! It will be quite perfect to wear during Christmas, too! I will definitely color-match all the decorations. Here is the little secret thing about this project. 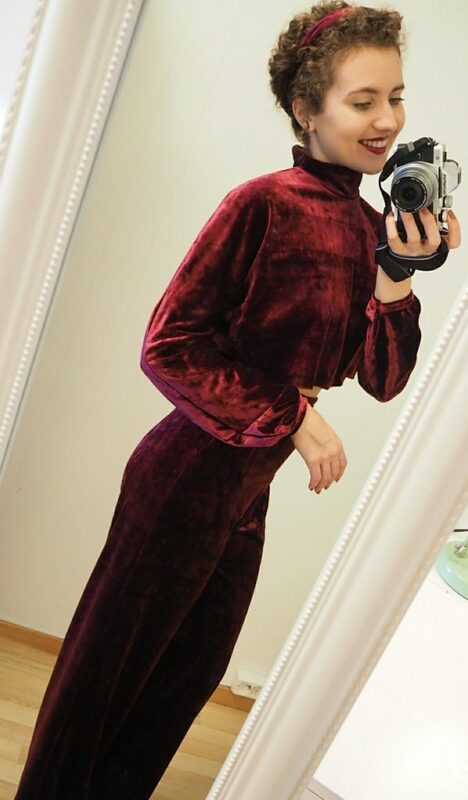 In order to make this velvet suit, I took the pattern for DIY Vintage Trousers that I made recently and the pattern for DIY Vintage Jacket. 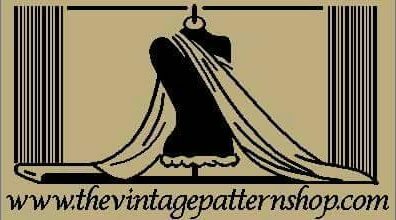 Isn’t it cool that one pattern can yield so many different outfits? There are few little tweaks that you need to implement to get the trousers and top, but they are really minor. 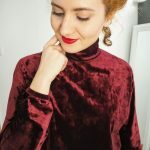 The biggest difference between my vintage-inspired projects and this velvet suit is the material. 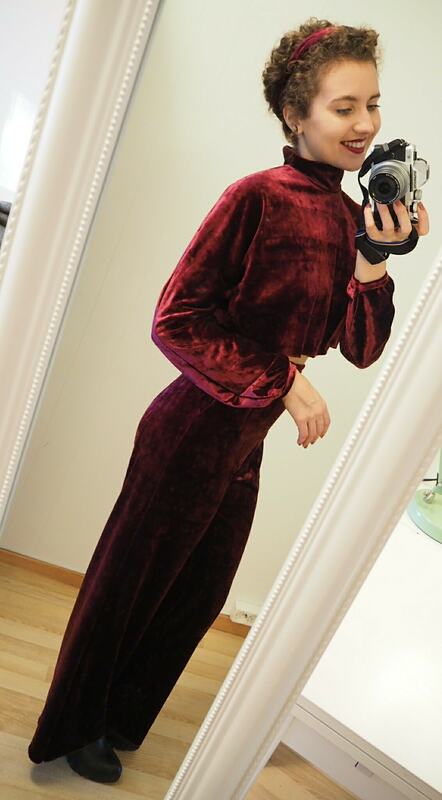 Before I show you the secret formula for this royal set of Red Velvet Pants and Top, have a look at it’s not-so-royal (but still awesome!) cousin, made in velveteen. 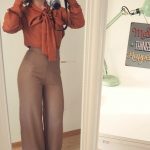 Click on the link to DIY Vintage High-Waisted Pants and follow steps 1 to 7. Instead of making a double hem, like in Step 8, I used fusible tape to hem my trousers. It created a very clean, seamless, invisible hem. 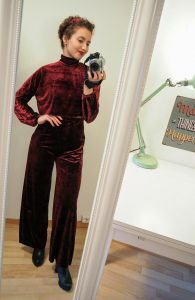 Save this project for later and let me know if you feel like making your own DIY Red Velvet Pants!